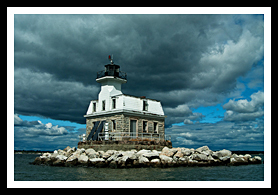 The lighthouse sits atop a dangerous reef about a mile offshore from Fairfield, in Long Island Sound. 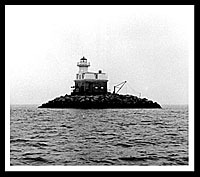 Penfield Reef was known by most mariners as one of the most treacherous ledges in Long Island Sound, and after many shipwrecks off the reef, a lighthouse was established in 1874. In rough seas on a cold morning in December 22, 1916, Keeper Jordan decided to row ashore to join his family for Christmas. The rough seas capsized his dory a couple hundred yards away from the lighthouse shore and he started to drift away from the shoreline from the gust of wind. The Assistant Keeper, Rudolf Iten, watched in horror from the shore. Iten grabbed a boat, and as he tried to row towards Keeper Jordan, the winds had shifted against him. He could not get his boat near the Keeper, who at this point had drifted nearly two miles away from the shore with the constant wind gusts. Fearing for his own life, Iten had to give up on the rescue and watch the Keeper drift helplessly away, eventually drowning in the cold seas. Iten, who became Keeper afterwards would write of observing a ghostly figure several times believed to be Jordan’s ghost. Other paranormal sightings have been documented over the years. Keepers were busy with frequent rescues over the years that followed. Keeper William Shackley rescued a captain and his wife during a storm in 1929. In 1930, Assistant Keeper Pastorini saw four people clinging to an overturned sailboat. He was able to rescue three as one swam ashore and survived. A few years later 27 grateful people were rescued from a sinking pleasure boat. Stratford Point Island is open on Tuesdays and Thursdays from 7:00 a.m. until 3:00 p.m., and is a great place for birding. Migrating monarch butterflies appear on the island in huge numbers during late September and early October. Fairfield looks like what an outsider might envision of a typical pristine New England large sized town, though the neighborhoods are of an affluent friendly community. It was voted in 2006 as one of the best places to live in the country, and provides visitors and residents with plenty of parks, beaches, and quiet places to hike and walk around this beautiful area. Check out the newly restored historic Penfield Pavilion at the Penfield Complex on Fairfield Beach Road with a nice clean beach. great place for picnicing and playing local sports too. As part of Fairfield County, the area offers plenty of cultural events, artist galleries, and specialty shops for its visitors. For those that want to do something different indoors (and also outdoors), visit Rock Climb Fairfield, and learn to scale and climb vertical walls safely. This is part of their Sportsplex area for education in exercise and training. The Fairfield Theater Company provides music, theater, and entertainment in Fairfield and in the Klein Auditorium in Bridgeport. The Connecticut Audubon Society’s Birdcraft Museum & Sanctuary is the oldest private songbird sanctuary in the United States. Boat cruise mentioned below offers many types of cruises. Visitors can not only embark on cruises involving marine life study and birding, they can book lighthouse cruises in the Spring along central Long Island Sound, covering Peck Ledge, Greens Ledge and Sheffield Island lighthouses in Norwalk, Penfield Reef Lighthouse in Fairfield and Stratford Shoal (Middleground) Light. 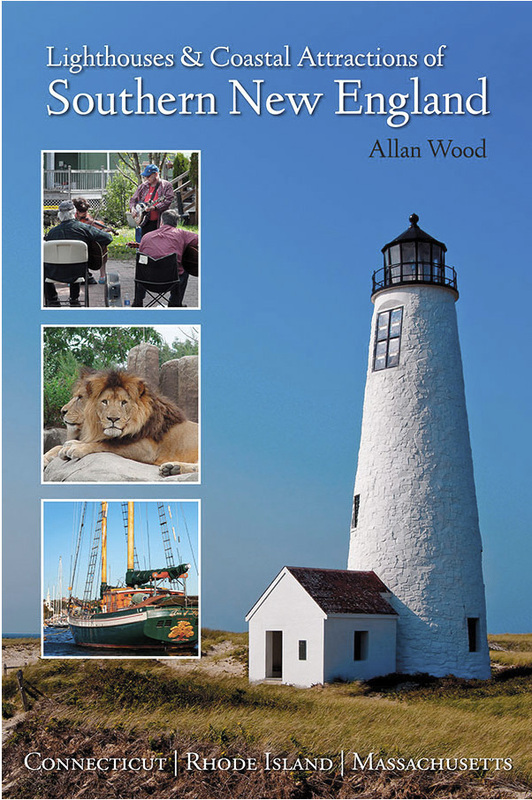 In the book you'll find a more detailed account of the story of Keeper Jordan, the sightings of his ghost afterwards by Assistant Keeper Rudolf Iten mentioned above, and other accounts of Connecticut's haunted lighthouses.